Women in today’s advanced capitalist societies are encouraged to “lean in.” The media and government champion women’s empowerment. In a cultural climate where women can seemingly have it all, why do so many successful professional women—lawyers, financial managers, teachers, engineers, and others—give up their careers after having children and become stay-at-home mothers? How do they feel about their decision and what do their stories tell us about contemporary society? Heading Home reveals the stark gap between the promise of gender equality and women’s experience of continued injustice. 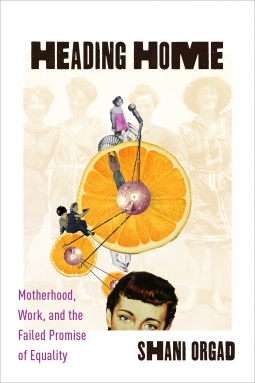 It draws on in-depth, personal, and profoundly ambivalent interviews with highly educated London women who left paid employment to take care of their children while their husbands continued to work in high-powered jobs. Equipped with the language of feminism, the women Shani Orgad interviews clearly identify the structural forces that produce and maintain gender inequality. Yet they still struggle to articulate their decisions outside the narrow cultural ideals that devalue motherhood and individualize success and failure. Orgad juxtaposes these stories with media and policy depictions of women, work, and family, detailing how—even as their experiences fly in the face of fantasies of having it all, work-life balance, and marriage as an egalitarian partnership—these women continue to interpret and judge themselves according to the ideals that are failing them. Rather than calling for women to transform their feelings and behavior, Heading Homepowerfully argues that we must unmute and amplify women’s desire, disappointment, and rage while demanding the creation of social infrastructure that will bring about long-overdue equality both at work and at home. Shani Orgad is associate professor in the Department of Media and Communications at the London School of Economics and Political Science. She is the author of Storytelling Online: Talking Breast Cancer on the Internet(2005), Media Representation and the Global Imagination (2012), and Caring in Crisis? Humanitarianism, the Public and NGOs (2017, with Bruna Seu). The author perfectly captured the guilt and other emotions experienced by women that have families and still want to have a fulfilling career and life.